Since the late 20th Century, the population of Kestrels as a whole across the UK has been in decline. Whilst in some areas the number of Kestrels has been stable, in other areas it has declined significantly. This has led to the Kestrel being ‘Amber-listed’ as a species of conservation concern in the UK. One of the difficulties with this situation is that the exact causes of the decline in Kestrels are not known. Loss of habitat has been suggested, along with decreasing prey populations, agricultural chemicals and lack of suitable nest sites. Kestrels do use both natural cavities (like tree hollows) and artificial cavities (such as old buildings) for their nests, and it is possible that reduced availability of nest sites like these is having an effect on their population. This limitation can be addressed by the provision of artificial nest sites (nest boxes). Nest boxes can be an effective conservation tool in areas where existing breeding sites are threatened with destruction, or are subject to human disturbance. Where suitable habitat exists, nest boxes can provide nesting opportunities for cavity nesting birds of prey. However, without suitable foraging habitat, the provision of nest boxes is likely to be less effective and so the protection of suitable habitat in addition to the provision of potential nest sites are two conservation methods that should be done together. 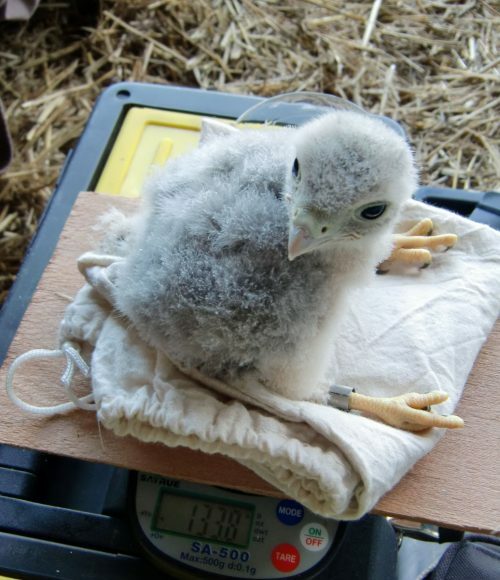 The Kestrel Conservation Monitoring Project is part of the Trust’s Raptor Nest Box Project. The project has the overall aim of assessing whether the installation of nest boxes across the landscape affects Kestrel population density. In addition to assessing changes in density, the project will also monitor breeding productivity and the effects of over-winter mortality. In combination, these will lead to a summary picture of how the breeding population changes over time. There is also potential to assess changes in the distribution of Kestrels across the study area, and if this is related to changes in environmental factors. The study area covers an area of 2240km² and is centred in Hampshire but also extends into Wiltshire, Surrey and West Sussex. It is divided into eight 280km² (20km x 14km) blocks. Within the study area, nest boxes are installed in suitable locations at regular intervals across the landscape. More than 100 nest boxes have been installed across the project area and these are monitored for use and productivity during both the winter and breeding seasons; any young produced in the nest boxes are fitted with BTO metal and colour rings for identification. Detailed surveys for Kestrels (and other species of bird of prey) are performed by running transects and recording the birds that are seen. The surveys are completed twice each year (in autumn and spring) to estimate densities both before and after the breeding season. Overall, the outcome from the project will be the development of density estimates for Kestrels (and other raptor species) within the project area. This fundamental measure will enable us to keep track of annual and seasonal changes in Kestrel numbers, and most importantly, to identify whether the presence of nest boxes across the landscape results in a change in the numbers of Kestrels over time. 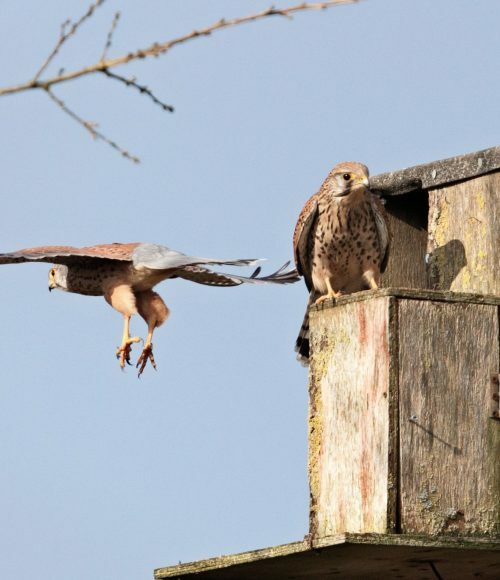 We expect the results of the Kestrel Conservation Monitoring Project to provide valuable information about the role of nest boxes in the conservation management of Kestrels, and how effective nest box installations are in addressing Kestrel population declines.